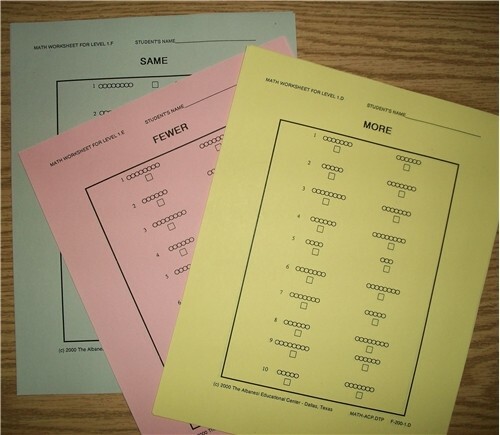 These forms are organized in packets of 30 sheets, 10 for each exercise. Children may work directly on the sheets by coloring and checking with an “x” each set of comparison indicated by printed bead-bars. For example, on the sheet which indicates FEWER, each set of two bead-bars is compared and an “X” should be placed next to the bead-bar that has fewer beads. These exercises are coordinated with the Albanesi Curriculum Program (A.C.P.) level #1of the PRE-M and Level #7 of the JE-M.